The mysterious new Kingdom Hearts title teased earlier this week is apparently Kingdom Hearts Re:Coded, a DS remake of a Japanese mobile phone game. Remember that news about a new Kingdom Hearts title that would be announced at E3? I'm just going to quote myself for a second, here: "It's possible that the new reveal will be Kingdom Hearts: Recoded, which was accidentally 'announced' by actor Phil Snyder, set to voice Jiminy Cricket." As it turns out, past-me was right on the money (intertemporal high-five!) 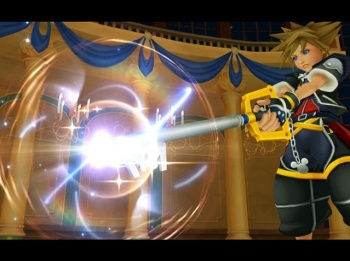 - Square-Enix revealed its E3 lineup today, and in the list was Kingdom Hearts Re:Coded for the Nintendo DS. While all we have to go on is the name and that it will be developed by 358/2 Days developer h.a.n.d., it's almost certain that this will be a more action-y remake of the Japan-only mobile phone title Kingdom Hearts: Coded. Now, when I say "mobile phone game," I don't mean Snake or even something like Canabalt - Japan takes its mobile phone titles more seriously than us in the West, after all. Coded was apparently a full-fledged spinoff with supposedly PSP-quality visuals, so it's not like we're getting a short, 2-hour experience for our money. But even so, I find it hard to get excited about this announcement. It's not that I don't like Kingdom Hearts, but from what I understand of Coded, the game has players revisiting (virtual recreations of the) worlds from the first game in order to fix bugs and set things right. How many times have we been to those worlds by now? Kingdom Hearts, Chain of Memories, Re:Chain of Memories, Coded, and now Re:Coded? That's five games essentially covering the same ground. That is some damn well-treaded ground by this point. That said, it's not all a letdown for Kingdom Hearts fans, since we'll also get to see the English version of Birth By Sleep at the show. Square-Enix will also be showing The 3rd Birthday, a PSP follow-up to PS1 cult hit Parasite Eve, though Final Fantasy Versus XIII and Final Fantasy Agito XIII are nowhere to be found.